PROMOTED: Hands on with the Philips multiroom speakers with Spotify Connect | What Hi-Fi? Spotify’s catalogue is bulging with some 30 million songs. Let’s assume that the average length is 4 minutes. That makes for 120 million minutes of music. Or 2 million hours. 83,333 days. It would take you 228 years to listen to it all if they stopped adding music to it right now. And since 20,000 songs are added daily… well, that could be a challenge. But if you fancy giving it a whirl, Philips multiroom speakers with Spotify Connect could be the answer. They connect to your home Wi-Fi network and let you use your smartphone or tablet as a Spotify remote control. This means that, assuming you have a Spotify Premium account, you can play music from the service in any room equipped with a compatible Philips speaker – and also use your phone as normal, taking calls, browsing the web and using apps. And because the music doesn’t stream directly from your phone, battery life is conserved and the sound won’t drop out if you quit the app. On the top panel are track-skip buttons, a play/pause control and volume up/down buttons. Under the grille the SW750M has four drivers (two 3in woofers and two 35mm tweeters), while the SW700M has two (both 2.5in full-range units). Set-up can be done in two ways: use the app to run through a step-by step guide (see below) or, if you can get to your router and it has a WPS button, use that to connect directly without having to enter any passwords. In your Spotify app you’ll notice a new Spotify Connect icon, lets you choose the speaker/s you want the music to play through. Tap one and then streaming duties are transferred to the speaker from your phone, which then acts as a remote control for track-skipping and volume. You can still access all your playlists too, as well as Spotify’s own curated content. If you have more than one speaker, you can play a song in one room, or in multiple rooms at the same time. And, if you’ve been listening on your smartphone outside, when you get home just press ‘Play’ on a Philips multiroom speaker to start the music playing in your house from where it left off. 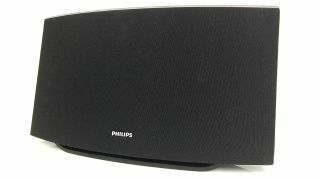 For more information about the Philips multiroom speakers with Spotify Connect, visit www.philips.co.uk. Philips also launched a variety of other products at this year’s massive Consumer Electronics Show in Las Vegas. Find out more here.